Erratic Weather Threatens Livelihood Of Rice Farmers In Madagascar : Parallels Climate change is complicating the lives of subsistence rice farmers in Madagascar. For years, the wet and dry seasons arrived predictably. No more. To survive, farmers are looking to diversify. 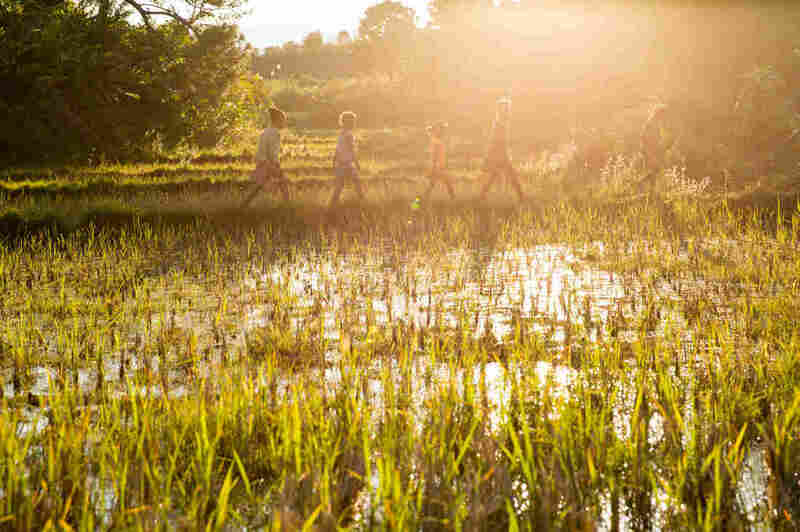 Children walk through a rice field outside the town of Kelilalina in eastern Madagascar. Rice is the dominant food and the dominant crop on the Indian Ocean island, but changing weather patterns are disrupting production in some parts of the country. 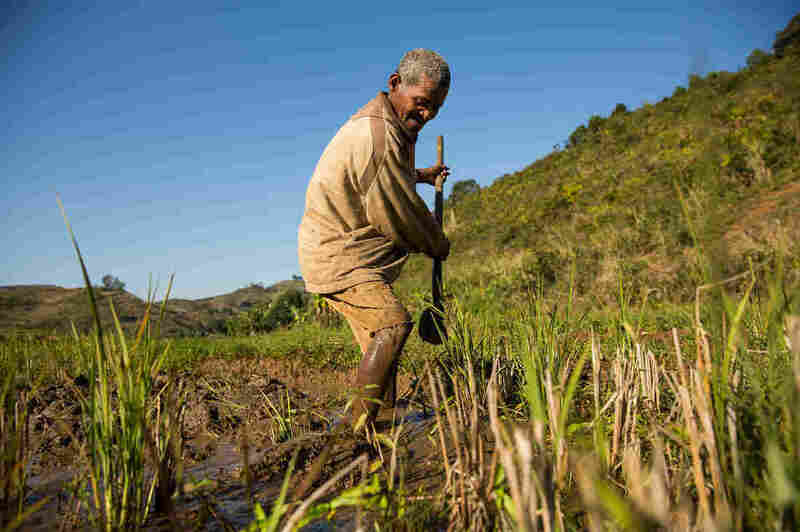 All his life, 56-year-old Jeanpier Marolahy has been growing rice in eastern Madagascar, on the steep hills that slope down from the central highlands toward the Indian Ocean. The thin, weather-beaten Marolahy knows that rice production is all about water and timing. The grain needs a lot of water at first, but if torrential rains fall at harvest time, they can destroy the crop. Rice is a hugely important part of life on the island nation off the southeastern coast of Africa. At times, it shows up for breakfast, lunch and dinner. In much of the country, it dominates the landscape, planted in small plots across millions of acres of land. But erratic rains and powerful storms are threatening rice production in parts Madagascar and putting the livelihoods of subsistence farmers like Marolahy at risk. For years, Marolahy says, the wet and dry seasons arrived in his fields in a relatively predictable pattern. But that is no longer the case. The weather has clearly changed, Marolahy says, from when he was a boy. Ankle-deep in the mud of a rice paddy, Marolahy notes that when he was a kid, this part of eastern Madagascar might get hit by a cyclone once every five years. Now, he says, he can get five big storms in a single year. 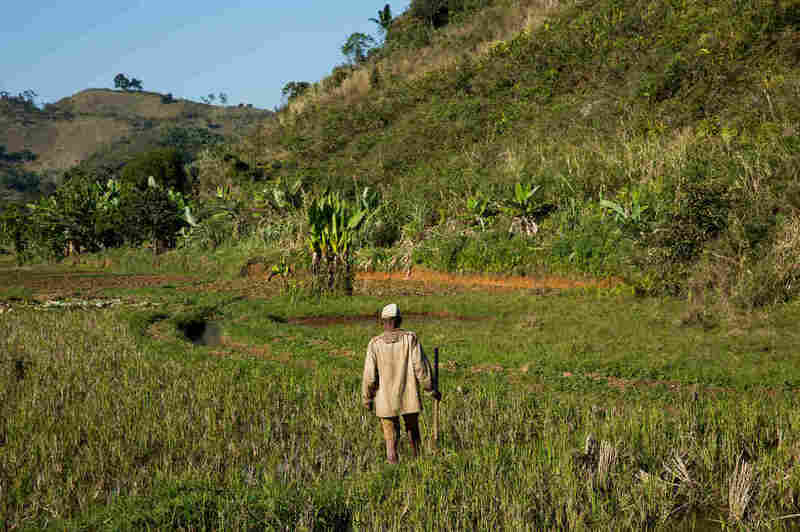 Jeanpier Marolahy has farmed rice all of his life in eastern Madagascar. The 56-year-old says the weather has definitely changed from when he was a boy. Rains are more erratic and cyclones more frequent. Complicating matters even more, this area was plagued by a four-month drought last year that Marolahy says was the worst he has ever seen. Marolahy has two small rice paddies in a narrow valley just outside the Ranomafana National Park. He also has two smaller plots of rice and vegetables terraced into an adjacent hillside. These four fields are the only source of income for his family. This year, the rains have been steady, but he says it has been abnormally cold and the seedlings are growing very slowly. "Look," he says, pointing to a 10-foot-by-10-foot plot of bright green rice shoots. "They are like this." He holds open his thumb and forefinger. "But they should be like this," he says, holding his hands about 6 inches apart. At night, he covers the seedlings with banana leaves to try to keep them warm. Marolahy isn't just another farmer complaining about uncooperative weather. Climate scientists say weather patterns are becoming more unpredictable. Researchers tracking the temperature in the adjacent national park say the highs and lows in this part of Madagascar have become far more extreme over the past two decades. In 2014, Celia Harvey, a scientist with Conservation International, helped conduct a study looking at how changing climatic conditions are affecting 600 small-scale farmers on the island nation. "We found that farmers are experiencing very variable rainfall and very variable crop production," Harvey says. The study also found that small-scale farmers in Madagascar are ill-prepared to deal with climatic fluctuations. "They have large families. They have very small areas of land. They're very poor. They lack access to basic services. They're really living on the edge in many ways," she says. "So they depend almost entirely on rice production for both their food security and for income generation. So anything that affects their rice production ultimately very quickly undermines their livelihood." According to the World Bank, three-quarters of the population of Madagascar lives in poverty. Most of those people survive by growing their own food. In Madagascar, these small, subsistence farms are particularly vulnerable to tropical storms. Madagascar is as long from tip to toe as Texas. Its 1,000-mile-long east coast stands as a long, straight bulwark protecting southern Africa from storms that barrel west across the open Indian Ocean. As ocean temperatures rise, climate scientists expect that more powerful and more frequent tropical storms will buffet Madagascar. "Madagascar is one of those countries that are very exposed to cyclones, and when cyclones come through, farmers typically lose most of their rice crop," Harvey says. Marolahy, the rice farmer, says he has few options on how to deal with the erratic weather. His land is the most valuable thing he owns. He can't just move somewhere else or find another job. His strategy to deal with the fluctuations in his rice yields is to expand. Later this year, he plans to burn the bushes off a hillside above his rice paddies and try planting cassava and beans. 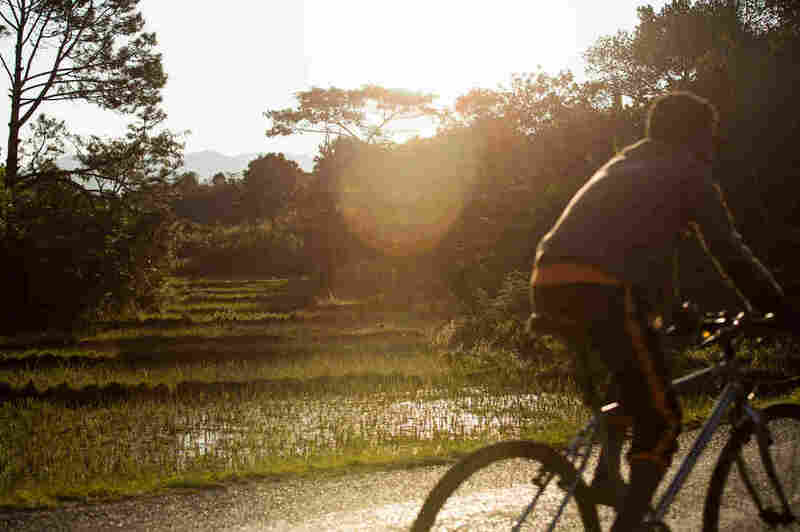 Not far from Marolahy's fields, another family of rice farmers is also diversifying. 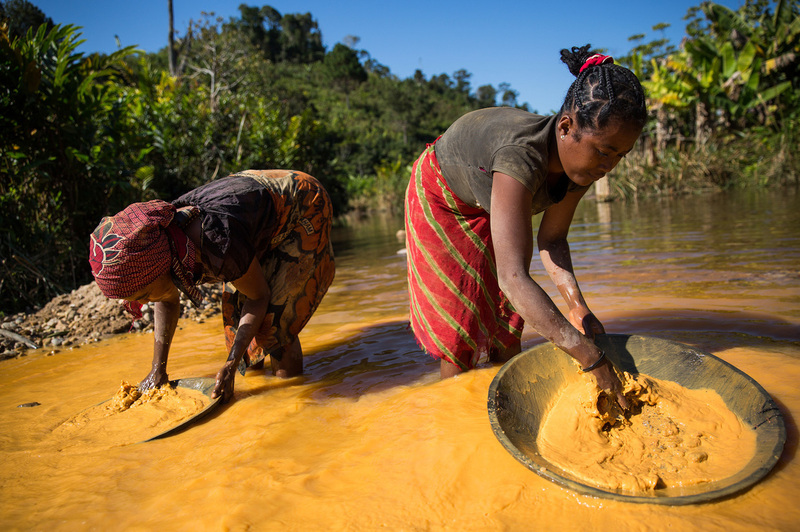 Perline Ramaniandaibe and her two daughters are panning for gold in a small stream that serves as both the sewer and the spring for the village of Kelilalina in eastern Madagascar. Ramaniandaibe says some days they don't find any gold, but other days, they find a few flecks of the precious metal. They use the gold to support their rice farm. "We don't have any other way to make money, only this, this gold," she says. 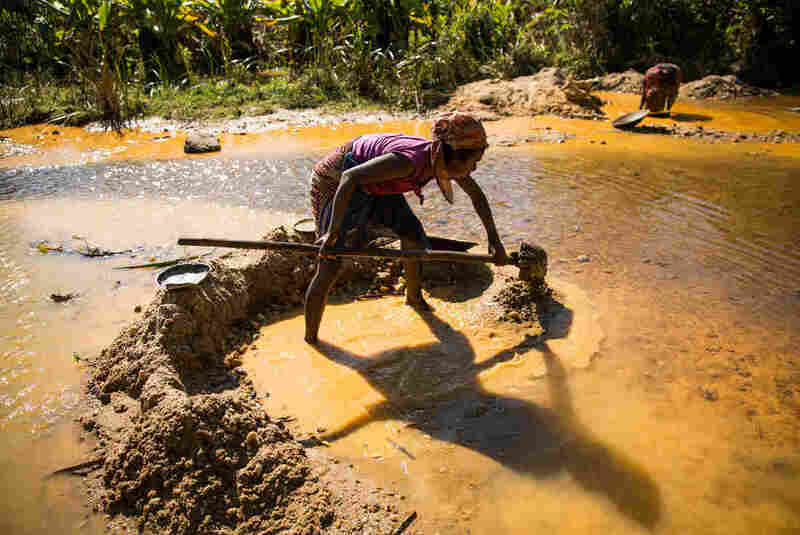 Rice farmers in Madagascar have started panning for gold to supplement their income. But there are days, these women say, when they don't find any gold at all. One of the benefits of panning for gold, Ramaniandaibe says, is that when flooding makes it impossible to work in their fields, the rising water cuts in to the hillsides, exposing soil that potentially could yield more gold. She concedes that ripping up agricultural land to search for gold is a problem over the long term, but at least it can bring in some cash when crops fail. And there may be another silver lining to climate change for some parts of the island. While researchers say storms and erratic rainfall will make it harder to grow rice in eastern Madagascar, rising temperatures might boost rice production in the central highlands of the country, where lower temperatures currently limit the growing season.